“Clark brought out a different aspect within me that had been hidden for a long time,” Natalia Warburton ’21 says. Natalia Warburton ’21 is only a sophomore, but she already has her sights set on her dream job: dean of world languages and cultures at Gallaudet University in Washington, D.C.
That’s no accident. Before attending Clark, Warburton volunteered at Gallaudet, which specializes in education for the deaf and hard of hearing and observed first-hand the power of bridging cultures through communication. The Jamaican native, who moved to Hartford, Connecticut, as a young girl, recalls her own struggles learning English. This experience inspired her to learn four languages, including American Sign Language, which she began studying at age 11 to better communicate with her friend’s sister, who is deaf. With the assistance of Clark American Sign Language (ASL) instructor John Dunn, Warburton has self-designed a major in ASL, deaf studies, and Spanish. She plans to take advantage of Clark’s membership in the Higher Education Consortium of Central Massachusetts by taking classes at Clark, Holy Cross, and WPI, which will contribute toward her degree. Like her academic choices, Warburton’s path to Clark was far from linear. After graduating from high school a year early, she worked full time at Georgetown University, where she helped run programs that advanced diversity and inclusion initiatives on campus. She also volunteered at Gallaudet, where she interviewed deans about the inner workings of their jobs and their inspirations. 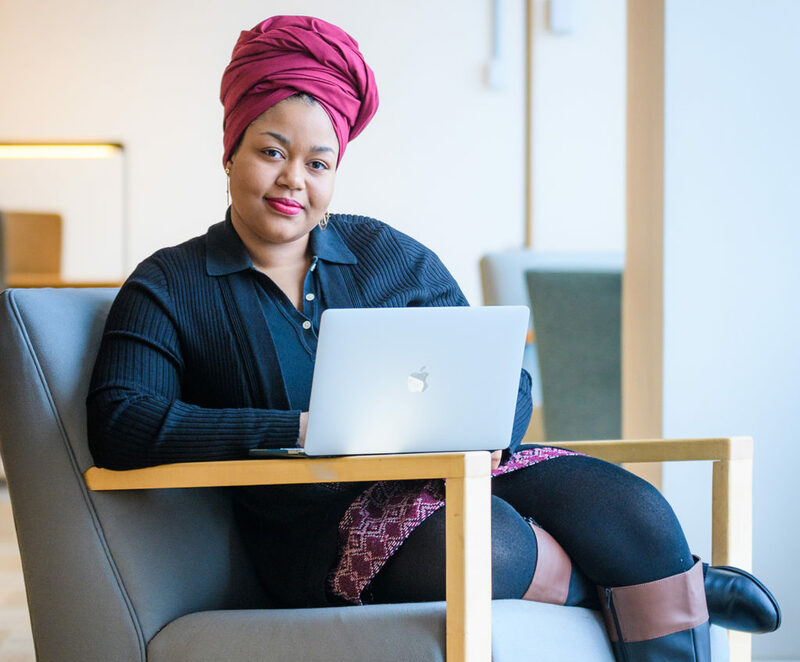 A self-described “compulsive planner,” she began charting her own educational journey several years before applying to college, keeping in mind her career goals and the particular challenges she would face as a woman of color and a first-generation college student. Warburton investigated colleges, and when she visited Clark, she felt an unexpected connection. At Clark, Warburton is involved in academic advising, where she helps students plan their undergraduate careers. She also hopes to add her perspectives and skills to diversity and inclusion efforts on campus. That goal is a career in higher education, specifically a dream job at Gallaudet. Ironically, the dean of world languages and cultures was a mentor for Warburton when she volunteered at the university. Is it intimidating that someone she knows and respects already holds the position she aspires to?